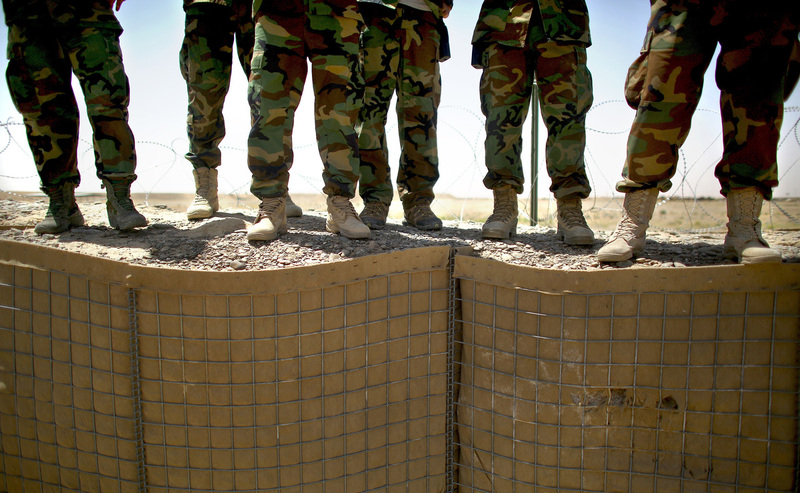 Botched Choice For Afghan Army Uniforms Wasted Tens Of Millions Of U.S. Dollars : The Two-Way AU.S. government watchdog says the Defense Department procured uniforms in a camouflage pattern that is far more expensive than other options and likely inappropriate for the landscape in Afghanistan. Afghan commandos train for a night raid on a Taliban-controlled village in June 2016. The Department of Defense procured uniforms for the Afghan Army in a camouflage pattern that is both far more expensive than other options and likely inappropriate for the landscape there, a U.S. government watchdog says. The pattern choice cost U.S. taxpayers as much as $28.2 million extra since 2008, according to a report out Wednesday, and if changed could save up to $72.21 million over the next 10 years. Nearly 1.4 million full uniforms and nearly 90,000 pairs of pants had a camouflage print designed to help military personnel blend in with a forest environment. But according to the report, only 2.1 percent of Afghanistan is comprised of forest. The findings were detailed in a report from the Special Inspector General for Afghanistan Reconstruction, or SIGAR — a military agency set up by Congress that audits U.S. spending in Afghanistan. No formal testing was carried out to assess whether the pattern was a good fit for the environment, according to the report. And while it stresses that determining a camouflage pattern's suitability can be complicated, some aspects are not — as one expert put it, "desert designs don't work well in woodland areas and woodland patterns perform poorly in the desert." The forest pattern wasn't just potentially inappropriate for Afghanistan, it was chosen over other options that were far less costly. As the report explains, there are two basic kinds of camouflage pattern categories: those that are proprietary (meaning they are owned by a company and require permission and possible licensing fees to use them) and those that are not (meaning no additional permission or fees). When it came time to choose a uniform pattern, personnel from the U.S. Combined Security Transition Command-Afghanistan (CSTC-A) carried out "internet searches" and came across proprietary patterns belonging to a Canada-based firm called HyperStealth. They then showed those patterns to Afghanistan's defense minister at the time and he "liked what he saw." Several months later, the Ministry had settled on the pricey forest pattern and the U.S. military personnel "began to move forward with the acquisition process." Uniforms made with that proprietary forest pattern are about 40 percent more expensive than the uniforms of the country's police, which have a non-proprietary camouflage pattern. And even as the Defense Department was ordering the uniforms, the report notes, the U.S. government "already had rights to multiple uniform patterns that were not in use by U.S. forces." Other coalition partners may have also had options to offer. A Defense Department contracting office apparently expressed concerns about the pattern choice at the time. However, a senior official with the CSTC-A responded that the Afghan army "has already chosen the pattern they want. We cannot and will not pick for them." The watchdog is recommending that the Defense Department carry out a cost-benefit assessment of the pattern, which the department says it will do. Among other cost-saving proposals, SIGAR proposes simply acquiring the rights to the pattern from the Canadian firm. As of March 31, Congress has appropriated some $66 billion to support the Afghan National Defense and Security Forces, SIGAR adds. Previous SIGAR reports have highlighted notable examples of wasteful spending, as we have reported. For example, it found that "nearly a half-billion dollars' worth of transport aircraft procured for the Afghans were found unfit for use and were scrapped for pennies on the pound." Also, "some buildings were built with concrete that dissolved in rain, or with walls and roofs that could collapse, or with unsafe wiring and inadequate plumbing."